Anxiety and depression are two separate conditions, but many people find that they develop simultaneously. Some of their causes and symptoms are very similar, so it can sometimes be hard to distinguish between the two. These conditions can be a result of hormonal fluctuations, external stresses, lifestyle, genetics, or a combination of these. Because they can be so distressing to live with, it is important to develop coping strategies for anxiety attacks and depression. What Are Anxiety Attacks and Depression? Not getting enough sleep can cause illogical thoughts, which can exaggerate depression or negativity, leading to anxiety attacks. To promote healthy sleeping patterns, it is important to make your bedroom cool, dark, and quiet, and to go to bed at roughly the same time every night. Exercise elevates mood by encouraging the release of serotonin and endorphins, the natural feel-good neurotransmitters. The recommended amount is around two and a half hours per week. Regular exercise will increase mood in the long-term, and this will reduce depression and the intensity and frequency of anxiety attacks. 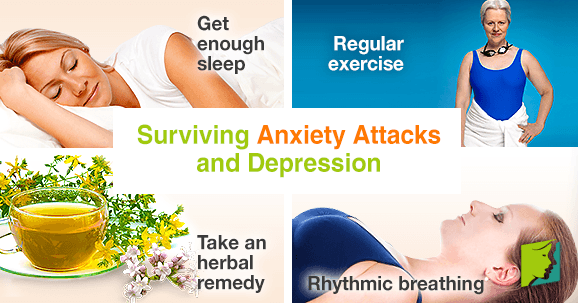 Riding a bike, swimming, walking, or gardening are all useful ways to fight anxiety attacks and depression. St. John's wort and valerian have been proven to reduce anxiety and elevate mood. With a better mood comes fewer anxiety attacks. St. John's wort is thought to work by prolonging the action of serotonin in the brain, and valerian contains substances that relax the mind and body. Spending 10 - 15 minutes a day practicing relaxation exercises is invaluable in the fight against depression and anxiety attacks. This is due to an increased sense of well-being and a decrease in blood pressure in response to the relaxation state. Rhythmic breathing decreases the pulse and respiration rate, which serves to reduce the frequency of anxiety attacks. Slowly inhale and then exhale, all the while paying attention to the body's natural relaxation response. Breathe as deeply as possible. The action of focusing on your body's relaxation should deepen the relaxed feelings. Learning simple techniques to invite positivity into your life is half the battle to beating depression and anxiety attacks. Some people just have one of the conditions, but many have both. Fortunately, as they both have similar causes and many of the same symptoms, it is possible in this case to kill two birds with one stone.